Last week ESA released a new synthetic aperture radar (SAR) dataset from NASA’s Seasat mission; nothing unusual in that you might think, except that this data is over 36 years old. As part of its Long Term Data Preservation Programme, ESA has retrieved, consolidated and reprocessed the Seasat data it holds, and made this available to the Earth observation (EO) community. 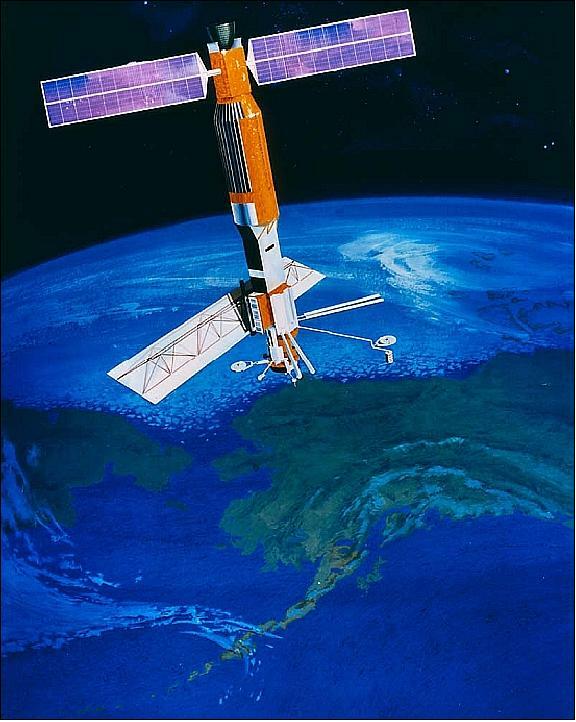 Seasat was a landmark satellite in EO terms when it was launched on the 27th June 1978. Not only was it the first satellite specifically designed for remote sensing of the oceans, but it was also the first to carry a SAR instrument. Seasat was only in orbit for 106 days as a problem with the electrical system ended the mission just over three months later on 10th October. Although, there is a conspiracy theory that the electrical fault was just a cover story, and the military actually shut down Seasat once they discovered it could detect submerged submarines wakes! Synthetic aperture radar (SAR) is so called as it uses a small physical antenna to imitate having a large physical antenna; to detect the long wavelengths would require a physical antenna of thousands of metres, while the same result can be achieved with a synthetic antenna of around 10 metres in length. It is an active sensing radar system which works in the microwave part of the electromagnetic spectrum, and uses pulses of radiation to map the surface of the Earth. Pulses are transmitted with wavelengths of between metres and millimetres, some of these pules are absorbed by the surface, whereas others are reflected back and recorded by the SAR. As the satellite moves, the antenna’s position relative to the area that it is mapping changes over time providing multiple observations. This movement crates a large synthetic antenna aperture, because all the recorded reflections of a particular area are processed together as if they were collected by a single large physical antenna, which gives an improved spatial resolution. SAR is extremely sensitive to small changes in surface roughness, and can provide both day and night imagery as it works independently of visible light, and is generally unaffected by cloud cover. It is used for assessing changes in waves, sea ice features and ocean topography, and recent research is applying it to other fields such as flood mapping. Seasat blazed the trail for SAR instruments, which has since been followed by many other satellites including ESA’s ERS-1 and ERS-2, ENVISAT’s ASAR, RadarSAT, COSMO-SkyMed, TerraSAR-X; and in 2014 both the Japanese ALOS, and ESA’s Sentinel-1, satellites carried SAR instruments. The potential value residing in Seasat data is demonstrated not only by ESA reprocessing Seasat, but last year NASA also released a reprocessed Seasat dataset. The use of historic data is one of EO most powerful tools, and it is one the remote sensing community needs to exploit more. This entry was posted in Copernicus, Data, Earth Observation, Envisat, ESA, NASA, Oceans, Remote Sensing, Space Can Help, Understanding Space and tagged antenna, Earth Observation, ESA, Long Term Data Preservation Programme, NASA, remote sensing, SAR, Seasat, Synthetic Aperture Radar by Andy. Bookmark the permalink.